Now that I was done with the paint and upholstery, the engine compartment was looking a little shabby by comparison. It was time to address this issue. The engine itself had been painted and detailed when I rebuilt it a few years ago. So things like the cam cover and the inlet manifold were in pretty good shape. But many of the other pieces in the engine compartment had not been touched since the car left the factory. I stripped the engine back to the cam towers by removing the air filter and intake tract, cooling system, washer pump/tank, fuel tank vapor recovery stuff, wipers, and headlight mechanism. And a bunch of rubber hoses! With the engine bay revealed, I assessed the paint. The engine compartment is painted silver, the original color of the car. My evaluation determined that to do the job right with a color change to blue, I would need to remove everything, including the engine, and do some serious metal prep. The various nooks and crannies would most likely require that sand or soda blasting be used. I decided that this was a bridge too far for the level of restoration I was doing on this car. Also, the silver paint complements the blue exterior. So I simply used my power washer, Purple Power, and a scrub brush to clean off the years of accumulated gunk. There was a dramatic improvement by the time I was done. As I began to put parts back into place, I followed a simple plan. A few parts got replaced. The brake master cylinder got replaced with a new one as a safety item. The brake fluid reservoir, the coolant pressure tank, and the windshield washer tank were replaced because I could not find any way to restore their yellowed plastic material to an OEM white look. The coolant pressure tank is also a quasi-safety issue, as I warped the head on my track car once because the yellowed tank is not amendable to coolant level inspections between runs. Two bushings in the headlight mechanism were replaced and the windshield washer hoses were replaced. Beyond those items, everything else was salvagable. Worth mentioning is that the fan motor for the interior heating system was missing when I pulled the plastic cover! I found a new fan motor on the internet for roughly $30. Call me skeptical when I ordered it but it was a perfect fit and works well. I suspect it was so cheap because it is a common VW part. BTW, the spark plug leads and various ignition related components were replaced during the engine rebuild. Ditto for all of the coolant hoses and the large J tube between the air meter and the throttle body. I will take a moment to give a shout-out to Jason at Paragon-Products, who is my go-to parts supplier for new 944 parts. But back to the plan. Many of the metal items were most likely yellow zinc or cad plated when now. As this is a sacrificial coating, it goes gray over time as it reacts with the environment. All of these items were lightly bead blasted and repainted with a rattle can silver rated to use directly on engine blocks. This is overkill but I knew the paint would not fail due to high temperatures in the engine compartment. Many brackets and all of the mechanism to operate the head lights were painted silver. Most the plastic parts are black. They were cleaned up with soap and water and touched up with a satin black spray paint rated for use on plastics. All the rubber hoses were treated with Meguiars Rubber and Vinyl treatment, which I’ve had good luck with. There is a rubber material on the firewall that was in pretty poor condition. I stripped it off and replaced it with a black neoprene rubber material, attached with contact cement. That was a dramatic improvement. I also replaced the neoprene material on the underside of the hood with new material that I purchased from Classic9 Leathershop. Oh, and I spent the better part of a day getting the headlights lined up to open and close properly. A long story that I won’t go into but there are multiple adjustments that must be coordinated. Suffice it to say they now work well. 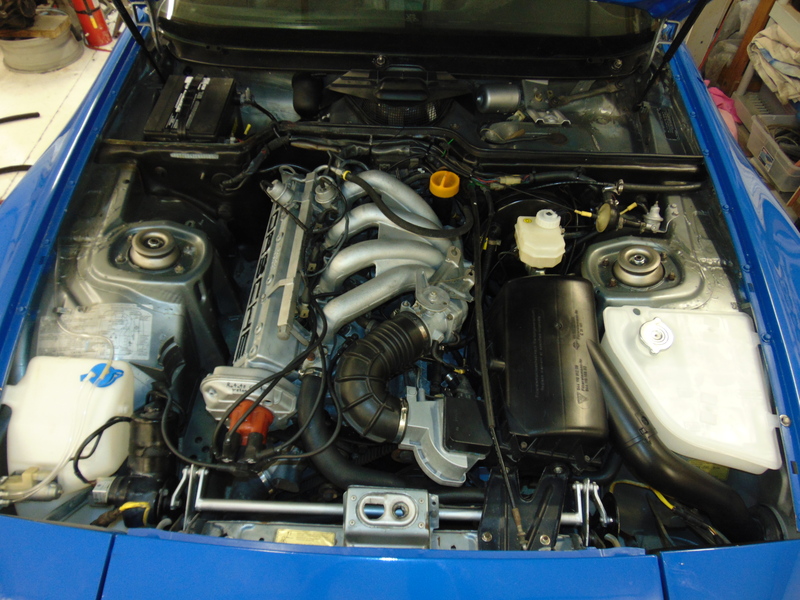 The end result was a dramatic improvement to the engine compartment’s appearance. It won’t make the car any faster but it will be a pleasure to pop the hood at any event!